Absorption - loss of acoustic energy due to conversion to heat. Accreditation - the official certification that a model or simulation is acceptable for a specific purpose. Acoustic daylight - imaging of underwater objects using the ambient noise field. Acoustic impedance - characteristic acoustic impedance is quantitatively equal to the product of the density and sound speed of the medium. Acoustic tomography - inverse technique that uses acoustic signals to sample the interior of a water body. Adiabatic process - thermodynamic change in which there is no transfer of heat or mass across the system boundaries. Advection - movement of oceanic properties by currents. Ambient noise - background level of unwanted sound in the sea, exclusive of occasional (transient) noise sources. Ambient noise models - mathematical models that predict the levels and directionality of noise in the ocean due to surface weather and shipping sources. Analog models - controlled acoustic experiments in water tanks using appropriate scaling factors. Analytical models - same as physical (physics-based) models. Anticyclonic - gyral pattern of motion, induced by Earth's rotation, that is clockwise in the northern hemisphere but counterclockwise in the southern hemisphere. Archipelagic apron - a gentle slope with a smooth surface on the sea floor. Attenuation - loss of acoustic energy due to the combined effects of absorption and scattering. Backscattering - scattering of sound in the direction of the source. Bank - an elevation of the sea floor located on a shelf. Baroclinic - state of stratification in the ocean in which surfaces of constant pressure intersect surfaces of constant density. Barotropic - state of stratification in the ocean in which surfaces of constant pressure and surfaces of constant density are parallel. Basic acoustic models - category of models containing underwater acoustic propagation, noise and reverberation models. Basin - a depression of variable extent, generally in a circular or oval form. Bathythermograph - instrument used to measure water temperature versus depth. Beam displacement - lateral displacement of an acoustic beam, of finite width, undergoing reflection at a water-sediment interface. Beam noise statistics models - mathematical models that predict the levels and directionality of low-frequency shipping noise for application to large-aperture, narrow-beam passive sonar systems. Bistatic - geometry in which the acoustic source and receiver are not at the same position. Borderland - a region adjacent to a continent that is highly irregular with depths in excess of those typical of a shelf. Bottom bounce - ray paths that have reflected off the sea floor. Bottom limited - ocean environment characterized by a water-depth and sound-speed profile that will not support long-range refracted paths. Bottom loss - reflection loss at the sea floor. Boundary conditions - constraints imposed on possible solutions of the wave equation by adjacent surfaces. Buoyancy frequency - frequency at which a water parcel displaced from equilibrium will oscillate. Canonical sound-speed profile - standard sound-speed profile applicable to ocean areas having a deep sound channel; the profile normally assumes an exponential form in the region of the sound channel axis. Canyon - a narrow, deep depression with steep slopes. Caustics - envelopes formed by sets of tangential rays. Cell scattering models - mathematical models of reverberation based on the assumption that the scatterers are uniformly distributed throughout the ocean. Chaotic - a deterministic process for which certain ranges of parameters are unpredictable. Composite roughness model - model that partitions treatment of boundary scattering into two regimes according to large-scale and small-scale surface roughness. Conjugate depth - depth below the sound channel axis at which the value of sound speed equals that at a shallower depth above the axis. Constructive simulation - models and simulations involving simulated people operating simulated systems. Continental margin - a zone separating the continent from the deeper sea bottom, generally consisting of the rise, slope and shelf. Continental rise - a gentle slope rising toward the foot of the continental slope. Continental shelf -zone adjacent to a continent or island from the waterline to the depth at which there is usually a marked increase of slope to greater depth (shelf break). Continental slope - zone between the continental shelf and the continental rise. Convergence zone - ray paths formed by long-range refraction in deep-water environments having both a critical depth and sufficient depth excess. Cordillera - an entire underwater mountain system including all the subordinate ranges, interior plateaus and basins. Coriolis force - an apparent force acting on moving particles resulting from Earth's rotation; the force is proportional to the speed and latitude of the particle, and results in a deflection to the right of motion in the northern hemisphere, or to the left of motion in the southern hemisphere. Crank-Nicolson method - method for numerically solving partial differential equations of the parabolic type (can be considered integration by the trapezoidal rule). Critical angle - angle in the vertical plane separating the angular region of total reflection from that of partial reflection and partial transmission at a boundary. Critical depth - depth at which the value of sound speed equals that of the near-surface maximum sound speed. Cusped caustic - intersection of two (smooth) caustics. Cyclonic - gyral pattern of motion, induced by Earth's rotation, that is counterclockwise in the northern hemisphere but clockwise in the southern hemisphere. Cylindrical spreading - form of geometrical spreading that is confined between two parallel planes. Decibel - unit of measure of acoustic intensity based on a logarithmic scale. Deep scattering layer - layer of biological organisms associated with an increased scattering of sound. Deep sound channel axis - location of the deep-sound speed minimum in the ocean. Deterministic - state of being completely predictable (as distinguished from stochastic or chaotic). Diagnostic information - information used to analyze the past or present state of a system, particularly with reference to identifying sonar system pathologies. Diel - characterized by a 24-h period. Diffraction - frequency-dependent interference effects. Direct path - ray paths directly connecting source and receiver over short ranges without boundary interaction. Dispersion - separation of sound into component frequencies; condition in which the phase velocity is frequency dependent. Diurnal - having a daily cycle. Domains of applicability - the spatial, temporal or spectral ranges over which a model's output can be considered valid; in general, such limitations are imposed by the model's physical or mathematical basis. Doppler - frequency shift resulting from relative motion of source and receiver. Downwelling - downward-directed water motion in the ocean. Ducted precursors - acoustic energy that leaks out of a surface duct, travels via a convergence zone or bottom bounce path or both, before coupling back into the surface duct down range. Earth curvature correction - correction applied to the sound-speed profile to adjust for propagation of sound over the curved Earth surface rather than over a flat surface. 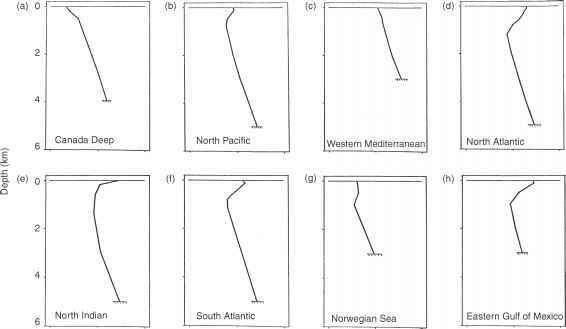 Eddies - isolated patterns of gyral motion in the ocean. Eigenray - ray that connects the source and the receiver. Eigenvalue - solution to the normal-mode equation. Eikonal - acoustic path length as a function of the endpoints. Ekman drift current - surface current produced by the wind, but directed perpendicular to the wind direction. Empirical models - mathematical models based on observations. Environmental models - empirical algorithms used to quantify the boundary conditions and volumetric effects of the ocean environment. Escarpment - an elongated and comparatively steep slope of the sea floor separating flat or gently sloping areas. Fan - a gently sloping, fan-shaped feature normally located near the lower termination of a canyon. Fast-field models - mathematical models of acoustic propagation based on a variation of the normal-mode technique. Fathometer returns - multiply reflected echoes arriving from the sea surface directly above or from the sea floor directly below a monostatic sonar. Feature model - statistical representation of a common synoptic structure in the ocean such as a front or an eddy. Fidelity - the accuracy of a simulation representation when compared to the real world. Figure of merit - quantitative measure of sonar performance; value equals allowable one-way transmission loss in passive sonars or two-way transmission loss in noise-limited active sonars. Finite difference - mathematical technique for solving differential equations. Finite element - mathematical technique for solving complex problems; in underwater acoustics, this method is implemented by dividing the range-depth plane into a gridded pattern of small elements. Fracture zone - an extensive linear zone of unusually irregular topography of the sea floor characterized by large seamounts, steep-sided ridges, troughs or escarpments. Front - boundary between two different water masses. Galerkin's method - a member of the class of so-called weighted-residual methods and a variational formulation that has been the generally accepted basis of finite-element discretizations. Gap - a depression cutting transversely across a ridge or rise. Gaussian beam tracing - method that associates each acoustic ray with a beam having a Gaussian intensity profile normal to the ray. Geodesic path - shortest distance between two points on the surface of an elliptical Earth; the shortest distance between two points on the surface of a spherical Earth is referred to as a great-circle path. Grazing angle - angle in the range-depth plane measured from the horizontal. Half channel - ducted environment defined by the equivalent sound-speed profile either above or below the deep-sound channel axis (the deep-sound channel is considered to be a full channel). Harmonic solution - solution to the wave equation based on a single frequency. Hidden depths - concept that regards as unimportant the deep ocean sediment structure below the ray turning point. Hill - a small elevation rising less than about 200 m above the sea floor. Hindcast - estimate of a previous state of a system. Hole - a small depression on the sea floor. Hybrid models - models based on multiple physical or mathematical approaches in order to broaden the domains of applicability. Incidence angle - angle in the range-depth plane measured from the vertical. Inertial motion - periodic, quasi-circular oceanic motions influenced by Earth's rotation. Isotherm - line connecting values of equal temperature. Knoll - an elevation rising less than about 1 km above the sea floor and of limited extent across the summit. Levee - an embankment bordering either one of both sides of a sea channel, or the low-gradient seaward part of a canyon or valley. Limiting angle - angle of ray measured relative to a horizontal surface that leaves the source tangent to the horizontal plane. Live simulation - simulation involving real people operating real systems. Lloyd mirror effect - near-field interference patterns associated with a shallow acoustic source and receiver. Marginal ice zone - area of ice cover separating pack ice from the open ocean. Mathematical models - category of models containing empirical models and numerical models. Mesoscale features - dynamic features of the ocean with characteristic length scales on the order of 100 m to 100 km; examples include eddies and internal waves. Mixed layer - surface layer of uniform temperature that is well mixed by wind or wave action or by thermohaline convection. Moat - a depression located at the base of many seamounts or islands. Modified data banks - data banks containing modified or extrapolated data derived from a primary data bank. Monostatic - geometry in which the acoustic source and receiver are at the same position. Mountains - a well-delineated subdivision of a large and complex feature, generally part of a cordillera. Multipath - propagation conditions characterized by a combination of different types of paths. Multipath expansion models - mathematical models of acoustic propagation based on a variation of the normal mode technique. Noise models - mathematical models of noise levels and directionality in the ocean consisting of two categories: ambient-noise and beam-noise statistics models. Normal-mode models - mathematical models of acoustic propagation based on the normal-mode technique. Normal modes - natural frequencies at which a medium vibrates in response to an excitation. Nowcast - estimate of the present state of a system. Numerical models - mathematical models based on the governing physics. Ocean impulse response function - time-variant and space-variant Green's function that describes the response of the ocean medium to a unit impulse. Parabolic equation models - mathematical models of acoustic propagation based on a solution of the parabolic versus the elliptic-reduced wave equation. Pathological test case -specification of inputs to a model that prove to be particularly troublesome; a test case that produces disorders in an otherwise well-functioning model. Physical models - theoretical or conceptual (physics-based) representations of the physical and acoustical processes occurring within the ocean. Plain - a flat, gently sloping or nearly level region of the sea floor. Plateau - a comparatively flat-topped elevation of the sea floor of considerable extent across the summit and usually rising more than 200 m above the sea floor. Point-scattering models - mathematical models of reverberation based on the assumption that the scatterers are randomly distributed throughout the ocean. Primary data banks - data banks containing original or modestly processed environmental acoustic data. Prognostic information - information used to forecast the future state of a system, particularly with reference to predicting sonar system performance. Propagation - transmission of acoustic energy through the ocean medium. Propagation models - mathematical models of underwater acoustic transmission loss consisting of five categories: ray-theory, normal-mode, multipath expansion, fast-field and parabolic equation models. Province - a region composed of a group of similar bathymetric features whose characteristics are markedly in contrast with the surrounding areas. Range - a series of generally parallel ridges or seamounts. Rayleigh parameter - measure of the acoustic roughness of a surface. Ray-theory models - mathematical models of acoustic propagation based on ray-tracing techniques. Reef - an offshore consolidation with a depth below the sea surface of less than about 20 m.
Reflection - return of a portion of the incident energy in the forward direction after an encounter with a boundary. Refraction - directional changes in acoustic propagation caused by density discontinuities. Reliable acoustic path - ray paths formed when a source or receiver is located at the critical depth. Reverberation models - mathematical models of reverberation based on boundary and volumetric scattering processes consisting of two categories: cell- and point-scattering models. Ridge - a long, narrow elevation of the sea floor with steep sides. Saddle - a low part on a ridge or between seamounts. Salinity - a measure of the quantity of dissolved salts in sea water. Scattering - random dispersal of sound after encounters with boundaries or with volumetric inhomogeneities. Seachannel - a long, narrow, shallow depression of the sea floor, usually occurring on a gently sloping plain or fan, with either a U-shaped or V-shaped cross-section. Seamount - an elevation rising 1 km or more above the sea floor, and of limited extent across the summit. Self-noise - noise background originating from own ship or sonar structure. Shadow zone - region of the range-depth plane into which little, if any, acoustic energy penetrates owing to the refractive properties of the water column. Shoal - an offshore hazard to navigation with a depth below the sea surface of 20 m or less, usually composed of unconsolidated material. Signal processing models - mathematical models of signal detection processes. Significant wave height - the average height of the one-third highest waves of a given wave group. Sill - the low part of a ridge or rise separating ocean basins from one another or from the adjacent sea floor. Simulation - dynamic execution of models to generate prognostic or diagnostic information. Skip distance - distance traveled by a ray that just grazes the sea surface, the sea floor or some intermediate layer in the ocean such as the sonic layer depth. Smart systems - simulated people operating real systems. Soliton - Internal solitary waves in the ocean, often generated by the nonlinear deformation of internal tides. Sonar performance models - mathematical models organized to solve specific sonar applications problems; contain environmental models, basic acoustic models and signal processing models. Sonic layer - acoustic equivalent of mixed layer; surface layer characterized by near isovelocity conditions. Spherical spreading - form of geometrical spreading that is unbounded. Spur - a subordinate elevation, ridge or rise projecting from a larger feature. Stochastic - state of being random; describable in probabilistic terms. Surface duct - propagation channel bounded by the sea surface and the base of the sonic layer. Surface loss - reflection loss at the sea surface. Tablemount - a seamount having a comparatively smooth, flat top (also called a bench). Thermocline - region of the water column characterized by a strong negative temperature gradient. Thermohaline - of or relating to the effects of water temperature (thermo) and salinity (haline). Transmission anomaly - difference between the observed transmission loss and the loss expected from spherical spreading alone. Trench - a long, narrow and deep depression of the sea floor, with relatively steep sides. Trough - a long depression of the sea floor, normally wider and shallower than a trench. Turning point - position in the range-depth plane at which an upgoing or a downgoing ray reverses direction. Upwelling - upward-directed motion in the ocean. Validation - the process of determining the degree to which a model is an accurate representation of the real world from the perspective of the intended uses of the model. Valley - a relatively shallow, wide depression with gentle slopes, the bottom of which grades continually downward (as opposed to a canyon). Verification - The process of determining that a model implementation accurately represents the developer's conceptual description and specifications. Virtual mode - mode associated with acoustic propagation in the surface duct. Virtual simulation - simulation involving real people operating simulated systems (human-in-the-loop). Water mass - body of water characterized by a unique temperature-salinity relationship. Wave equation - equation describing motion of acoustic waves in the ocean. Whispering gallery - phenomenon relating to the propagation of sound along the curved walls of a gallery, especially those of a hemispherical dome.